Meet Michael. Michael visited Goodwill on his day off from work to share some big news. Looking at the smile on his face, you would never guess how many obstacles, barriers, headaches, and heartaches he's endured. Before coming to Goodwill, Michael spent six hours each workday commuting by bus to stay employed. He was eager to advance his career, shorten his commute, and live independently. 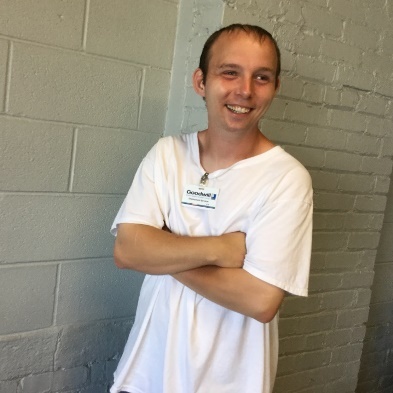 At Goodwill, Michael received personalized employment services. He prepared his resume with guidance from his Goodwill career navigator and practiced interviewing. In March, Michael earned a job at a nearby manufacturing company, cutting his commute drastically. He beamed with pride as he told us about his full-time job earning more than $11 an hour and receiving full benefits. This new job allowed Michael to move into his first apartment, one of his many goals. Now he’s saving money to buy his first car and is preparing for the driver’s license test. The other big news? He earned his first two days of paid time off. Way to go, Michael!